Having a SEO strategy in mind prior to launching your SEO campaign is one of the most critical steps that a SaaS company must make. So how do you start ? Set a goal whether its lead generation or product download it is imperative to have an end goal in mind which will make life much easier. 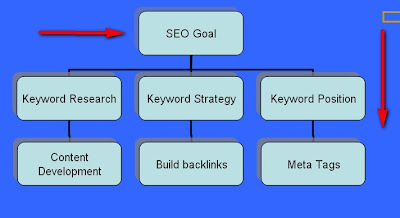 After having identified the goal, the next biggest thing is strategizing the process on how to execute that SEO goal. I would first start by developing a list of keywords that are highly relevant to your service or product such as: SaaS download, SaaS Demo, SaaS whitepaper, SaaS webinar etc. Now these keyword phrases have monthly search frequencies as show below. What that means is that a specific keyword is search 200 times on Google. As you can tell the ultimate goal is to show up in the first three or four position on Google SERP in order to get maximum exposure. The big question is how to go about creating a strategy for these keywords and show up on page one. Well that’s the million dollar question that everyone asks themselves everyday. It is crucial to keep in mind that these keywords are the core keywords that your company must compete and work hard for high search engine rankings. It seems easy but in reality its not because you must know how to develop the right content, where to get the right links, how to write the meta tags and which keyword to style. Search Engine Optimization requires deep understanding of web marketing as well as technical aspects of the website in order to succeed in this type of online marketing. Having the right people handling this aspect of your online marketing is well worth the money. However, don’t fall for the big SEM agencies scam as they will overcharge you for the same work as an in-house SEO employ will do or a SEO freelancer. Keep in mind that most SEM agencies make search marketing sound like a rocket science and very difficult to execute but it’s actually not. You can hire an in-house SEO person or hire a SEO freelancer who will do the work for half of the price.